You’ve seen it in movies and series wherein people no longer use cards as identification and go for chips inside their body. It’s mostly seen in futuristic settings and if that’s the case then the future is here. 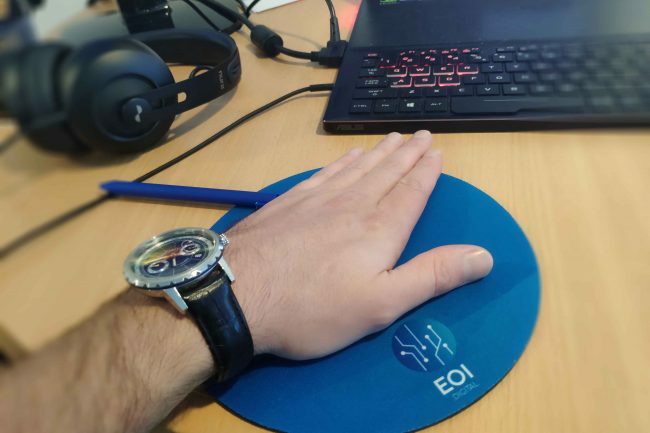 Our CTO Amadeo Brands has already been chipped with the purpose of having biometric security at secure logins but he also experimented with embedding a encrypted keystore files in his hand wich he can use to store his private keys safely and securely. Amadeo got his chip in Stockholm during the Bloxpo event from the company Biohax where they had a boot to promote and explain there technology. In this post we wanne explain what BioHax is and how companuies can use it and why companies should potentialy experiement with this new technology and do not have to be afraid about anything. Biohax which is a Swedish microchip company has been steadily growing as more and more people are getting in touch with them. It has “chipped” over 4,000 people in Sweden and other all over Europe. While it focuses more on health use such as heart rate and blood sugar monitoring, it also has other uses. These implants are comparable to microchips used on pets and are place between the thumb and forefinger. The whole implant process lasts only a few seconds. According the The Telegraph, all of which are interested in getting microchip implants for their employees. The primary benefit of this procedure is how convenient it will be. With the microchip implant standing as one’s ID, these chips can get you anywhere in the building and pay for things in the office. They are also easy ways to restrict entry to some off limit areas. Once it’s there, these work like contactless payment systems wherein employees just present their hand to the scanner for activation. Back in November, MarketsandMarkets did a research which revealed that the estimated worth of the global biochip market would be$17.75 billion by 2020. Even futurist Elon Musk announced that he will be supporting Neuralink, a California-based company that implants electrodes in the brain. While it is understandable that some are unsure about the idea and the invasive feeling, you cannot take away just how convenient it is. As a regular person in the city, you probably have your wallet filled with tons of cards. From your work ID, gym membership, bank cards and some of which have passwords you have forgotten. You then have your giant set of keys for doors, lockers and cabinets that you’ve accumulated through the years. These problems are obsolete for all the biohackers since they can just unlock doors, pay tickets and enter gyms with a swipe of their hand. The entire rail network of Sweden is biochip-friendly so you can literally just hand out towards the conductor. More and more gyms and offices are also incorporating it to make everyone’s lives a bit easier. Once you’ve experienced their daily activity, you can see the amount of time you waste in so many things. From the doctor’s appointment and their long search for your medical record to rushing to find change to create tips, all this can change. A biochip smaller than a grain of rice manages all these issues. Biohackers refer to these instances “friction”. Friction is the time we can spend on more important things but are diverted with time consuming activities. For it to truly take off, it needs to become a legitimate business. Österlund discussed that he is steadily raising capital for Biohax with investors making big investments. He is calling on a hundred doctors and nurses to help him in the implant process. This will officially start when Biohax gets legitimized. More and more companies are calling like Tui Group which is the world’s biggest travel company. More than a hundred are now chipped due to overwhelming requests from the employees. The managing director of Tui, Alex Huber, believes that the chipping is just a mental barrier we need to get over. He says people’s privacy are a lot more invaded with their phones. As they continue to grow, they signed a deal with Verisec which is an information technology security company in Stockholm. With the partnership, the chips can be used for normal electronic payments and store documents. He says his challenge is to get as much of the market share in biochips as there may be bigger companies who can start mass producing their own. It’s currently being by NXP Semiconductors in Germany and it gets assembled in China. His goal is to manufacture it in Sweden and hopes that it will pave the way to mass acceptance. As of the moment, they are focusing on system and testing and providing better security and privacy on the platform. While Österlund knows that it’s possible to launch it in so many countries at once and sell as much as possible, he also acknowledges that would be an irresponsible choice. There needs to be a robust system that can protect people’s integrity and privacy. The future seems bright and very, very convenient. Our very own co-founder is securing his cryptoassets with biometric security. There is so much opportunities that comes with chipping. If you want to learn more or simply work your brand to transforming digitally, one small step at a time, we are here for you. Talk to us and let’s get your business to the future.